This coming week Osteopaths all over the world will be celebrating International Osteopathic Health Week. 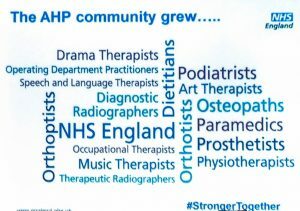 For us it’s especially exciting because Osteopaths in the UK have recently become Allied Health Professionals, which is a group of trusted and respected twelve health professions, including Occupational Therapists, Speech and Language Therapists and Paramedics. This is yet another proof of how highly regarded Osteopaths are by the NHS and the general medical profession.